For the monthly garden club meeting tomorrow all members have been asked to bring along a mug of flowers to set on a table, just for the fun of it. 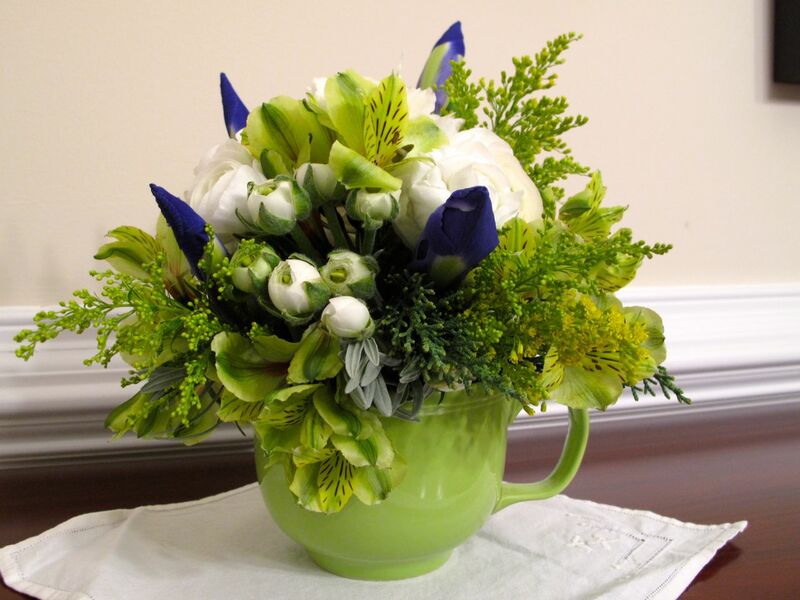 I used a lime green mug to hold Ranunculus, Iris, Alstroemeria, Solidago, Lavender and Juniper. It will be fun to see all the flower-filled mugs. This entry was posted in garden and tagged Alstroemeria, floral arranging, flower arranging, iris, lavender, Ranunculus on March 25, 2013 by pbmgarden. I love your choices, they are really beautiful. Your garden must be quite amazing. I have all of those plantings all with the exception of Ranunculus. I even have the green mug; though mine has the Monsters, Inc. faces on it. It does hold a real mean cup of herbal tea. Thanks! Oh, I wish these flowers were from my garden, but only the Lavender and Juniper are. The irises here are not very far along–just leaves. Never thought to grow Alstroemeria but it would be handy to have. Is it difficult? Lovely colour combination. I like unusual vessels for holding cut flowers. Lovely selection, they look very pretty in your mug. I am trying to grow Ranunculus for the first time, seem to be waiting for ever for the flowers to appear! I have had some Alstroemaria growing in the garden for nearly 10 yrs now, they are so easy! Beautiful. I love the green mug idea. The arrangement you gave us is finally drooping. We have really enjoyed it. Thanks. Glad you’ve enjoyed those flowers. On this one I started with the green mug and then bought the flowers. The irises are open today. Love this! 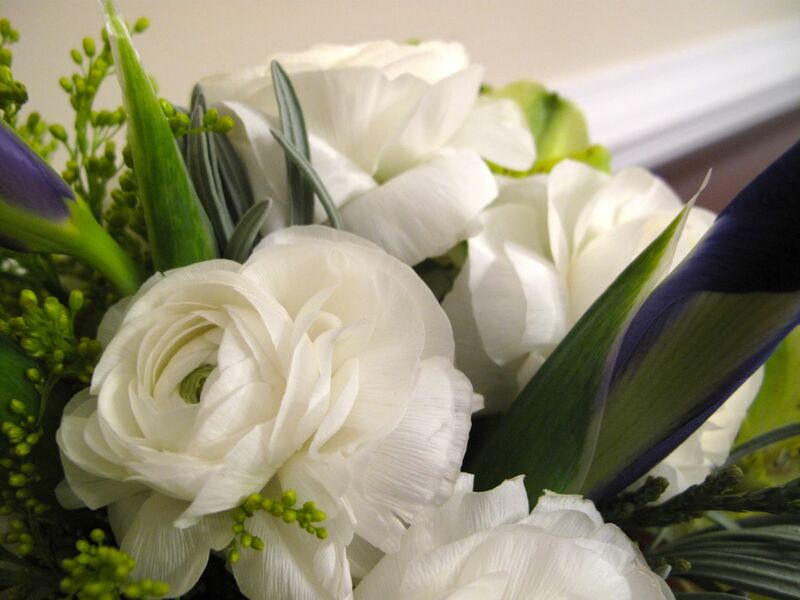 Would you believe that your last arrangement looks as fresh as ever (with a couple of exceptions)? Still enjoying it-got lots of compliments for you from our guests Saturday. Thanks Judy! Glad the flowers stayed fresh. Love the bright spring colors!! Thanks Donna, I enjoyed working with those colors. We can all use some spring color about now!